Construction of a 608kWp solar carport at insurance firm Aviva’s Norwich site has been completed. The 1,872-panel array is anticipated to generate 542,000kWh of clean power each year. 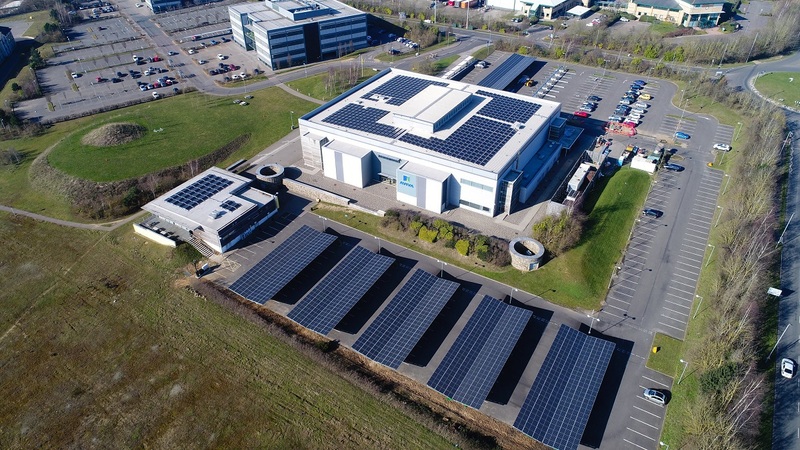 At peak generating capacity, around 91% of the energy generated from the panels will be used by Aviva’s office at Broadlands Business Park, which houses around 1,000 employees. Any excess will be exported to the national grid, however plans to add electric vehicle chargers to the facility are under discussion. The construction of the solar carport was undertaken by Norwich-based firm RenEnergy and forms part of Aviva’s commitment to tackling climate change, with the company having achieved a 60% reduction in CO2e against a 2010 baseline. Property and facilities director at Aviva, Stuart Wright, said that the carport would help the company to reduce their environmental impact without impacting on their car parking space. Wright added that the carport ensures Aviva is “ready for the future, with the electric vehicle revolution just around the corner”.